When it comes to polymer frame single stack 45’s, there aren’t many options. 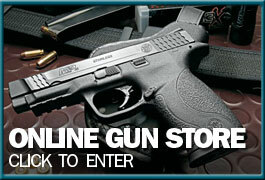 You have the Glock 36, Springfield XDS, and the Kahr CW45. There are others but they are so rarely asked about that we don’t think they are worth mentioning here. From a dealer’s perspective, the Springfield XDS is by far the leader of the group. There is one more to add to the group because just a few weeks ago, Smith & Wesson released the Shield 45 which will likely be tough competition for the Springfield XDS. The first thing you will notice when you pick up the Shield 45 for the first time is the grip texture. It is much more aggressively textured than the 9mm version, but not too aggressive. It feels and looks like a very tastefully done stipple job. They have also added forward cocking serrations, which seem to be more for looks than they are for giving you a better purchase on the front of the slide when press checking your chamber. The trigger feels very similar to the 9mm shield which is fairly smooth and light. Now let’s talk about the trigger reset. It doesn’t feel much different than the 9mm shield, however, there is an audible click almost immediately after you start releasing the trigger that sounds and feels like a reset. This may be a problem for some shooters in the sense that it could be distracting but I’m assuming most people will just ignore it. We’re hoping that this will go away after it has been broken in but the Shield 45 that our Smith & Wesson rep brought in for us to see did the same thing and it had been shot quite a bit. Another thing that may throw people off is that both the flush fit magazine (6 round capacity) and the extended magazine (7 round capacity) have windowed slots on the side that are labeled 6+1. Just to be clear, the extended magazine (pictured on the left) holds 7 rounds and the flush fit magazine (pictured on the right) holds 6 rounds. They are labeled correctly on the bottom of the base plate. It blows my mind that they decided to label the magazines this way. I actually confused myself a couple of times trying to explain this. Anyway, moving on. We were very impressed with the accuracy of the Smith & Wesson Shield 45 and to be such a compact 45 it’s surprisingly easy to shoot. There isn’t as much recoil as we anticipated and for the most part, the rounds went right where we wanted them to. We didn’t have a single malfunction the entire time at the range and we did throw in a box of Hornady Critical Defense to make sure it cycled properly with defense ammo. Here are five round groups from 7, 10, and 15 yards. The comparison pictures we have below of the Shield 45, Glock 36, and Springfield XDS are all pictured with a 6 round magazine. We also took a couple comparison pictures with the Shield 9. Overall we are very pleased with the Shield 45. The are only a couple of negatives that stand out. One is the false trigger reset we mentioned earlier. I will say that it didn’t seem to be an issue as we were firing on the range. It’s something we forgot all about after we started shooting. The other is that the slide release is so stiff that it is almost unusable. Other than that, it’s accurate and relatively soft on the recoil, it looks and feels great, and it’s priced right around $430-440 which is about $50 less than the Springfield XDS 45. We believe Smith & Wesson has a winner with this one. Maybe we will be seeing a Shield 45 Performance Center in the future. We plan on keeping this Shield 45 that we reviewed at the store on display for a couple of months for folks to handle. If you’re interested in checking it out feel free to stop by the store! We do have a waiting list for these and if you’d like to be added please email your name and phone number along with a request to be added to the list to info@carolinagunrunners.com. Thanks for reading!